The Dublin to Galway Intercity rail line is a busy train route that required crossing as part of the Tullamore Wastewater Treatment Works expansion for Offaly County Council. Terra Solutions were tasked with this 1200mm hard-rock rail crossing. The sewerage treatment plant upgrade entailed the expansion of the plant from 16,000 PE to 45,000 PE and construction of a county sludge hub-centre for 80,000 PE. Construction work began on the site in May 2010 under a contract worth €20 million. The works proposed included the construction of new large diameter inlet sewers to the works. Improvements made to the inlet sewers in order to upgrade the influent entry system for the plant, required trenchless construction of a single sewer inlet under a railway embankment, with a diameter of 1200mm. This vital pipeline link was carried out by Terra Solutions tunnelling contractors and their experienced team using microtunnelling. The access area to the launch shaft of the proposed tunnel was severely restricted with a low bridge and height constraints. The road leading to the bridge was very narrow also. Exact measurements of lane width, height, bridge archway and turning angles etc. were taken by Terra staff and a detailed access and lifting plan devised to suit the 5 No. loads of heavy equipment that was to pass under the tunnel and be set-up at the launch position just past the bridge. Especially low carriers were sourced locally as well as series of rollers for the taller, more awkward, items of equipment. The microtunnelling team were set-up and ready to tunnel within 5 days. Terra Solution employed their 1200mm Herrenknecht TBM (tunnel boring machine) with a Bauer BE250 separation unit. 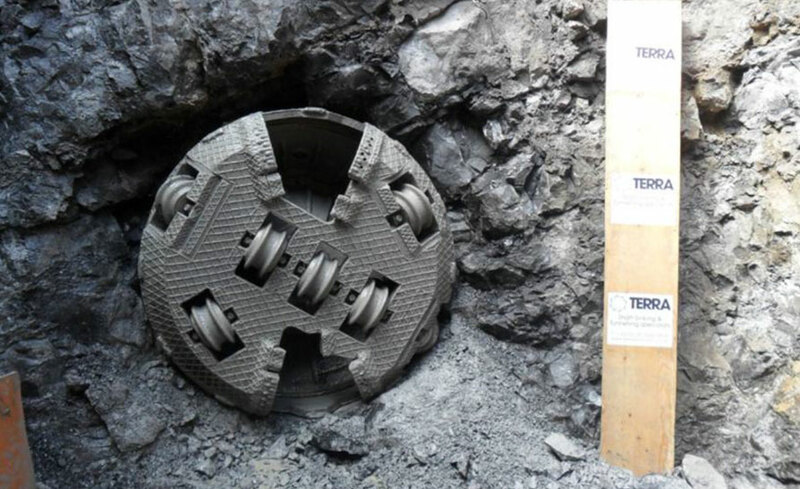 The TBM cutterhead was fitted with appropriate rock cutter discs to excavate the very strong 165 MPa limestone rock. At times the penetration rate of the tunnelling was as low as 10mm/min due to rock strength. This rock microtunnelling project was completed within 3 weeks and installed to exact line and level.